Every year, spurred on by the dry season on the African plains in Kenya and Tanzania, close to two million Wildebeests, Zebras, and Gazelles make the epic journey from their breeding grounds in the southern Serengeti to greener, wetter grass on the northern plains during what is known as the Great Migration. As the dry season turns to wet, they travel full circle back south. Year after year, governed by the seasons as they evolve from wet to dry and back again, this cycle repeats itself. Great travelers that they are, these migrants encounter dangerous predators and the kaleidoscope of wildlife on the African savannah along the way, from Lions and Leopards to Elephants, Dik-diks, and Dung Beetles. This safari will take you to Maasai Mara National Reserve in Kenya and Serengeti, Ngorongoro and Tarangire National Parks in Tanzania. After meeting you at the airport we will depart for a 4-night stay in the famous Maasai Mara Game Reserve. Depending on what time we arrive we will depart for a late afternoon game drive. Our lodge is perfectly situated to explore this great African Game Reserve. This is the best area in the Mara to see big game up close and some of the many mammals to be seen here include Black-backed Jackal, Bat-eared Fox, Banded Mongoose, Spotted Hyena, Serval Cat, African Lion, Leopard, Cheetah, Bush Hyrax, African Elephant, Common Zebra, Hippopotamus, Common Warthog, Masai Giraffe, African Buffalo, Eland, Steinbuck, Bohor Reedbuck, Thomson’s and Grant’s Gazelles, Impala, Topi, Coke’s Hartebeest and thousands of Wildebeest. We will also see many massive Nile Crocodiles, some over 15ft in length, basking in the sun along the banks of the Mara River. From here we will cross over into Tanzania and straight into the famous Serengeti Game Reserve, one of the best-known reserves in Africa. We will stay in the Central Serengeti for 3 nights from where we will enjoy the excellent game viewing offered by this park. 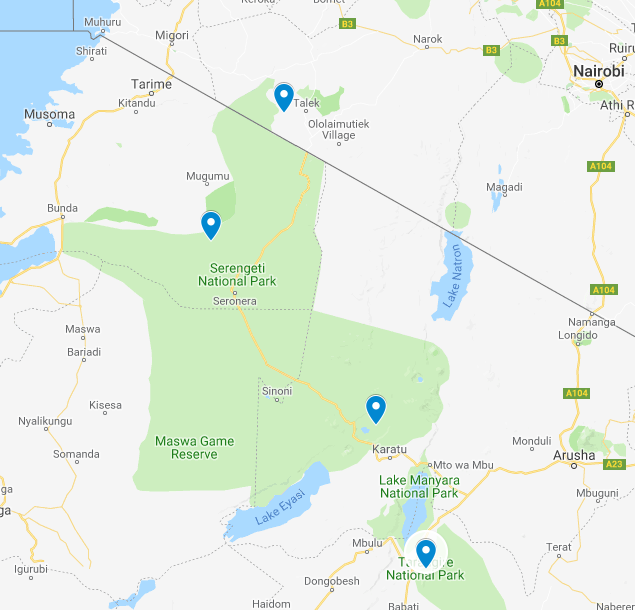 Today after breakfast, we do our last game drive as we depart Serengeti for Ngorongoro Crater where our lodge will be located just at the rim-edge of the crater. Besides enjoying the excellent game viewing close to the lodge we will be very close to the crater so very little traveling times between the lodge and the park. Supported by a year-round water supply and fodder, the Ngorongoro National Park supports a vast variety of animals, which include herds of Wildebeest, Zebra, Buffalo, Eland, Warthog, Hippo, and giant African Elephants. Another big draw card to this picturesque national park, is its dense population of predators, which include Lion, Hyenas, Jackal, Cheetah and the ever elusive Leopard. After breakfast we will depart to our lodge , located on the eastern shore of Lake Manyara. We plan to arrive in time for lunch and in the afternoon, enjoy a guided Bush Walk to the Manyara Lake Shore and learn about this Ecosystem. The following morning, we will drive with a picnic lunch to Tanzania’s third largest National park for game drive. Tarangire National Park offers the biggest elephant population in the region and the majestic Baobab trees are an interesting feature of the Park. Depending on what time your flight departs we will plan our morning activity and make our way to the Airport for the flight home.